If this catches on, all teenagers will pull this stunt to avoid having to go to school. Stupid that in the 50's you could show and tell your parent's rifle in class, 20 years ago Westerns were still popular but now just mentioning toy guns will get you expelled from school. Social engineering? Nah.. I finally understand Hope and Change. They change society and you hope you don't get arrested for things that were normal once. Checking out a kid with an airsoft rifle just seems insane to me. The kids play airsoft wars in the pasture land around the home i just moved from last year. Fear of firearms conditioning is complete. Hey kids test it yourself, spray paint a rough image of a firearm on your school wall and watch what happens. Shout the word gun in a crowded room. Lol, don't do any of this , there will be... trouble. Arrest, suspension, home searched over a picture alone with nothing else to corroborate an imminent threat, is lazy police work and stupid because the parents certainly have a case for a lawsuit now. Yeah true. It makes death so much more enticing, I never thought i'd look forward to that but this generation did it for me. I think you guys have done to yourselves... With all the endless threads I saw on ATS alone, after the Parkland shooting, of (apparently) freedom loving Americans claiming it was the fbi/police's fault because they didn't illegally detain Cruz or take his gun, simply because he made a disturbing post on social media. What did people think all that criticism of the authorities not taking enough 'pre-cautionary' action, on social media and by the alt-right MSM was going to result in? Life is not black or white. The choice is not either have authorities do nothing or have authorities arrest for anything. The authorities are not supposed to be machines. I do not expect, nor do I want, Robocop! There is such a thing as common sense, although it seems it is much less common that it should be. If the police cannot take the trouble to actually think about what they are doing, then they need to be thrown off the force and never allowed to even look at a badge or gun again. It is just as damn wrong to arrest a kid for posting a picture of his present as it is to not arrest a kid for making a credible threat. The part that is scarier than what happened, is that anyone would consider excusing it. Show a picture of a real (or apparently real) gun with the notation that you're going to school now... yeah, that deserves a second look. Post a picture of yourself holding a gun and claim you want to be a school shooter when you grow up? You got some 'splaining to do. Add in a history of domestic violence, and you got a problem. Post a picture of a toy gun, with the sticker that says so showing, and you're being a kid... no issue, no harm, no foul. Alert the cops? Sure, no problem. Suspend the kid? Hell fire and brimstone, NO! Arrest him? Get a warrant to search his house? GET OFF MY PLANET! My God in heaven, have we all gone completely insane? Wow well they have officially gone full retard . A high school senior was Arrested and suspended for posting a picture of an air soft gun he got for his birthday on snapchat. He posted it showing the sticker in full view saying it was a toy gun with the ominous message " have a nice day" and a smiley face. There was no threat and it is an obvious toy gun yet they pulled him out of class , searched his belongings, arrested him, then called his parents to tell them what happened and the police were on there way to search the house. And they came and searched the parents house. I would be livid and how the hell do they have any right at all to search him or his parents house over a toy.? No...sorry a picture of an effing toy. OODBRIDGE, Conn. (WTNH) – A high school student was suspended and arrested after posting an image of a toy gun on social media. 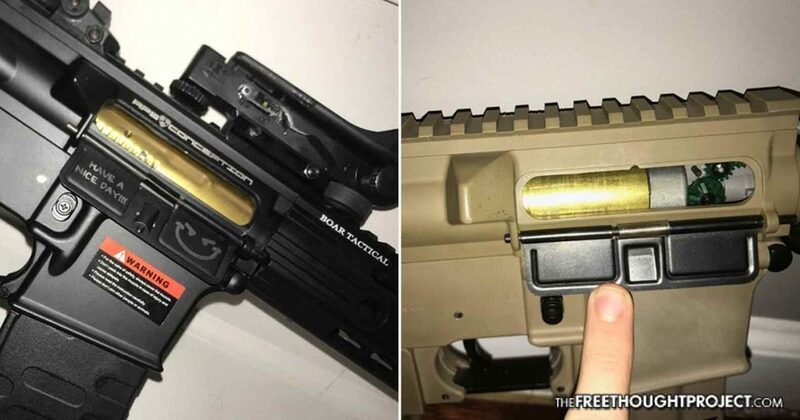 Zach Cassidento, a high school senior at Amity High Regional School was suspended and arrested as a juvenile after he posted a picture of a toy gun, or what’s called an “airsoft gun,” on Snapchat. Lol what the # kinda guns have you seen if you think that toy looks real in any way shape or form? Cause it sure looks like a toy to me...I didn't even read the sticker. It's his own fault. If he had simply posted a picture of a loaded AR-15 with a message about shooting students, nothing would have happened to him. Kids these days! OK, that's enough sarcasm to overfill twenty posts right there. Is there anyone left who doesn't realize by now that this is an agenda being driven to scare people? Either the loony tunes with a gun will get you or the cops will. What's the difference between the good guys and the bad guys today, anyway? They have the same weapons, they use the same tactics, they wear 'colors' to identify themselves to their victims, and they use physical force to enforce their will on others. I'm trying to understand how the police can demand to search the home when the toy is clearly identified as such? Illegal search and seizure? Malicious prosecution? Abuse of power? Someone needs a lawyer, and they need a lawyer fast! Even minors have rights. Extreme overreactions and overreach damage LE as a whole. While it should only reflect on these obviously incompetent and unconstitutional officers/judge who signed the warrant, the public won't see it that way. Hard to get sympathy for "the good cops" when you have worthless a-holes doing this kind of BS. Over a damn toy. That is PERFECTLY legal to own and display photos of (just as he could display photos of a real gun, that his parents permit him to have). Time to sue the pants off everybody involved. Only problem? it won't matter. Some genius thought it'd be smart to exempt public servants from personal liability while on the job. These blatant overreaches and abuses will continue until the individual public servants face personal liability for infringing on Constitutional rights - whether "accidental" or not. Time to start being more careful, I suppose. And well past time to stop being so damn cavalier with CONSTITUTIONAL RIGHTS. It is NEVER the time to "walk a thin line" between legal/unconstitutional. Resignations from ALL INVOLVED should be demanded. Where's our lefty friends at when we need 'em?